After the successful years of YES! Club World-Nepal, and with its International and National Programs and Projects such as BAL UTSAV- International Talent Hunt, YOUTH CAMP, Spread A Smile, NEW YEAR Special Flash MOB, STAND UP TAKE ACTION, Deusi Bhailo for a CAUSE, Film Making Workshop, Awareness through ART , Youth Interactive Series, Survey Projects, Rock Celebration and many others. In an insistence and the continuous interest of our well wishers from Kids, Teenagers and Youths along with their beloved Parents to have a special program this FESTIVAL. 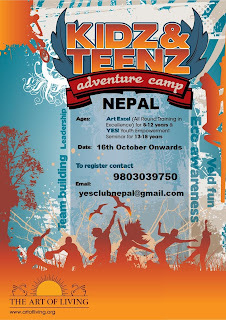 So, here we introduce KIDZ and TEENZ Adventure Camp. KIDZ and TEENZ Adventure Camp has been actually organized at South Africa after the immense success of Grishma Mahotsav in India and the Bal Utsav Celebration and Youth Camp in Nepal and also several programs at other countries. We have been organizing several programs more of focusing for kids, teenagers and youths also their parents and guiders- teachers , trainers and guardians. Kidz and Teenz Adventure Camp is not just an Adventure camp but it’s an adventurous camp that includes learning through FUN. There will be several activities for kids and teenagers that they would love to be in and that helps them a lot into unleashing their potentialities. We are offering some very unique programs that are very efficient and profound ones from workshops such as All Round Training in Excellence, Youth Empowerment Seminar to making the simpler the way they learn to from Mathemagic which actually includes Vedic Mathematics. Also, Youth interactive series for ages from teenagers to youngsters and several unique workshops. The session ill also have team building skills including community projects as per their education level and also adventure camp as we have said it. Also we have some special programs to cater for the parents and the idle teachers to learn more and emphasize on their children.